A sliver of white is lifted above a platform below a small dome surmounted by a tiny cupola. The dome is supported by four columns. At least that is what I think I see from across the museum gallery. A closer look brings a sudden shock: The white sliver is bone, a human finger. The finger’s platform is constructed out of bullets and shells; the dome and cupola covered with shotgun pellets; and the columns are pistol barrels, with the pistols still attached. According to the label, the finger belongs to “Santo Guerro,” a purposeful misnaming of an imaginary “Saint of War.” (Or, does it mean Saint Blondie?) But, the odd name is less important than my reaction upon viewing the image. Questions race through my brain. Is it sacrilege to surround a saint with weaponry? Is there a message here, something beyond the observation that most saints died through violence? Why do I feel my gut turn? 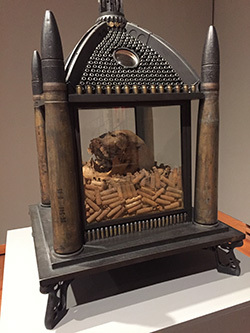 Not answering my questions, I move on and immediately run into the reliquary of Santo Guerro’s skull, lying in a glass box on top of a pile of empty 30-06 rifle shells. The skull’s unhinged grin mocks the serious character of its bed. Before the two reliquaries stands a model of a large Gothic cathedral. It is made mostly from ammunition, intricately put together. The child in me who loved models is attracted like a magnet; without thinking, I spend five fascinated minutes examining the doors and walls of shells, the soaring towers framed by rifle barrels and the flying buttresses made from gun stocks. I check the museum guide, expecting a name like “Trinity Cathedral” or some other name of a cathedral city. Instead it says, “The Spine and the Tooth of Santo Guerro.” Spine? What spine? I haven’t seen a spine, let alone a tooth. Wait, there it is. In the shadows within the cathedral. The model, too, is a reliquary. I start looking at the other models of sacred structures: synagogues, churches, mosques and mausoleums. I find a Bible open to the book of Revelation in a church and a Torah scroll cover in a synagogue model. The Muslim mausoleums contain tombs. They are all reliquaries. It is often difficult to interpret art, to find its meaning. But, one point is clear: The images are of the sacred and holy (saints’ remains, sacred texts and accoutrements) contained within the symbols of violence, ammunition and weapons of death. Even the models of Muslim mausoleums fit the pattern, for mausoleums usually contain the remains of holy men (sort of like Christian saints). Some forms of Islam, like the Saudis’ Wahhabism, vehemently deny that Muslims can be saints -- be holy men -- and that they can be revered after death. Indeed, they frequently enforce that denial at the point of a gun. Al Farrow’s artworks clearly juxtapose violence and the sacred. But, what is the message? He won’t say, so it remains unclear. What is clear, however, is that the exhibition grabs your attention. It may not provide answers, but the viewers certainly raise the question and discuss it among themselves. I often found myself across a piece from a stranger, pointing out features and debating with each other. Are religions violent? Are they victims of violence? The exhibition also contains three full-size doors (constructed of ammunition and gun parts) of religious structures: a mosque, a church and a synagogue. Each one is presented with graffiti and other violence enacted upon it. Perhaps the message is that religions visit violence upon each other. Hmmm. Al Farrow’s exhibition, “Divine Ammunition,” is on view at the University of Wyoming Art Museum through Dec. 16. Flesher is a professor in UW’s Department of Religious Studies. Past columns and more information about the program can be found on the web at www.uwyo.edu/RelStds. To comment on this column, visit http://religion-today.blogspot.com.